Since 2003, RDN biosolids have been used in a Forest Fertilization Program to improve tree growth and divert them from the Regional Landfill. This program demonstrates modern practices in forest ecology and stand management. Biosolids production, storage, and applications are carried out according to a Land Application Plan that meets all requirements set out in the Organic Matter Recycling Regulation and is subject to audit by the Ministry of Environment and Climate Change Strategy. RDN Biosoilds are applied to private forest lands owned by TimberWest (formerly leased to Vancouver Island University). 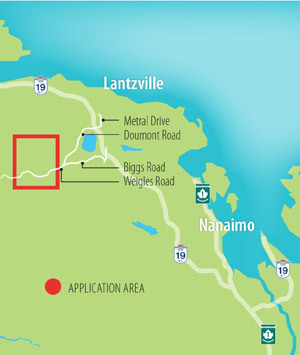 The application area is approximately 12 km northwest of Nanaimo, about 1 km west of the Biggs/Doumont Road intersection, just off Weigles Road. Click on the images to the right for detailed maps of the application area. The Mount Benson foothills are a popular area for outdoor recreation, particularly mountain biking. In June 2017, the RDN signed an agreement with the Nanaimo Mountain Bike Club to coordinate land use so that biosolids are not applied on key mountain bike trails while other areas are reserved for biosolids applications. The production, distribution, storage, sale and use, or land application of biosolids are strictly regulated by the Organic Matter Recycling Regulation. Biosolids samples are collected directly from wastewater treatment plants to ensure biosolids quality results are accurate and to verify compliance with the Organic Matter Recycling Regulation. The wastewater treatment process mimics the natural breakdown of wastes. When micro-organisms "digest" the solid material, they reduce volatile organics and pathogen concentrations. 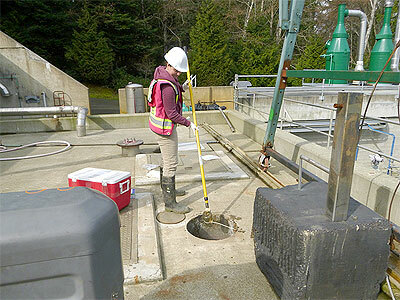 We regularly test our biosolids to ensure they meet Ministry criteria for land application. Suitable weather conditions (biosolids are not applied during heavy rain, over snow, or onto frozen ground). Biosolids are not applied within specified setback distances from water bodies, property boundaries, and public roads. Public access is restricted in the application areas through locked gates and signage. Signage is posted at entry points and along select trails advising the public that biosolids are applied. We monitor surface water across the biosolids application site.